Vintage Concert Poster Collecting -- How to Fail Miserably! Many collectors believe vintage concert posters represent the most exciting collectible opportunity in the marketplace today. Here's 4 ways to guarantee disappointment. On February 14, 2018, I traveled to Los Angeles, California to hear the advice of the world famous billionaire investor and businessman, Charlie Munger. Munger, 94, is Warren Buffett's business partner and Vice Chairman of Berkshire Hathaway. He is widely credited for contributing vastly to Buffett's success and his decades of wisdom have been published in a highly regarded book, "Poor Charlie's Almanack, which I highly recommend to all readers of this blog. Buy the book here. One of Munger's principal pieces of advice that he repeats again and again is "to invert, always invert". By that, Munger believes strongly that if you want something in life, the best way to get it is to list what you DON'T want and avoid that list. For example, if you want to find a great spouse or life partner, what are the 5 character traits you must avoid? If you want a great job, what are the 5 things you don't want in a boss, work environment and prospects for advancement? In this spirit, I'm giving you 4 common and easy to make mistakes , that if practiced rigorously, will guarantee failure and disappointment in your concert poster collecting activities. 1) Don't Research. There is an old saying in collectibles, buy the book before you buy the collectible. Ignore this saying. We have provided a standard list of reference books that EVERY concert poster collector should have. Ignore this list. Also, this marketplace is rapidly growing and changing month by month, as documented in this blog. Turn a blind eye to new opportunities, stay inflexible in your thinking, and keep your mind firmly rooted in the past. 2) Don't Plan. This is very common and very easy to pull off. Vintage concert posters are cool. REALLY cool! So just go ahead and start collecting without any goal or plan. You are guaranteed to quickly amass a very cool "pile of stuff". You won't have a collection that "hangs together", you won't be able to explain the significance of your collection to your friends, family and associates, and you won't experience any pride of ownership. With no pride of ownership, and no real goals attained or pursued, you will quickly lose interest and be on to "the next thing" before you know it. For beginning collectors, we provide a list of possible collecting suggestions that could provide a road map of how and where to stop. Ignore this advice. 3) If a deal looks too good to be true..buy it! Here's another oldie but goodie. A collector gains a little bit of knowledge, just enough to hurt themselves. Suddenly an opportunity appears that looks too good to pass up. Surely, the little bit of beginning knowledge you have attained puts you head and shoulders over everybody else that has been collecting for years, right? Maybe you are the first person to discover that there really is such a thing as a "free lunch". Maybe you should disregard the fact that the most successful collectors ALWAYS "pay up" for the rarest and finest quality. Maybe you will be the very first collector that rises to the top by picking off supposed bargains that only YOU were lucky enough to locate. Maybe! 4) Don't Look For a Dealer You Can Trust. You are masterfully doing steps 1, 2 and 3 listed above. YOU GOT THIS! You don't need help figuring out what opportunities to pursue. You don't need help figuring out what price to pay. You don't need guarantees in writing. You don't need consistent grading standards that have been clearly outlined. You don't need unbiased third party opinions about authenticity or grade. You don't need disclosures about hidden, professional restoration that is near impossible for anyone but an expert to detect. You don't need professional advice and guidance, because you have everything already figured out! If you enjoyed this blog, you may also wish to read an article about advice we received directly from Warren Buffett himself, and how it pertains to successful concert poster collecting. You can read that article here. How to Win Vintage Concert Poster Auctions Without Really Trying! Entering Secret "Max Bids" Can Save you Time and Money! At Psychedelic Art Exchange we work with alot of collectors that are highly successful individuals in their given field. A common frustration we often here from these collectors is that they are often too busy to be available to bid in our auctions at a specific day and time. "Isn't there a way they I can simply just buy this poster I want? ", is a question we hear repeatedly every time we launch an auction. While we cannot sell a lot privately that has been consigned to our auction, we do have a solution for those too busy to bid during the closing hours of our sale. As a registered bidder in our auction, you have the ability to enter two different kinds of bids, "straight bids" and "max bids". Entering a "straight bid" enters your bid at the next increment for the lot. An advantage of "straight bids" is that a collector can gauge "the heat" of the market, and adjust their bids up and down "on the fly," based on how values are being revealed in real time compared to their expectations prior to the sale. However, if the "straight bid" you entered is topped, you MUST be online and available to make an additional bid before the auction closes, or you will miss out on the lot you are interested in acquiring. Since many bids come in during the closing minutes of an auction, it is all but essential that you be available at this time, if you wish to win a lot utilizing "straight bids". It's all but impossible to enter a straight bid days before an auction closes, walk away, and win that lot. It almost never happens. A solution to this predicament, is the secret "max bid". When you enter a secret "max bid", you are asking our platform to bid up to a set amount on your behalf. Your current bid will be entered at the lowest possible increment, NOT AT YOUR MAX BID, and no other bidders will be aware of your max bid. If someone tops your current bid, the platform will automatically bid again on your behalf, up to the "max bid" you previously entered. It's like having your own personal assistant monitoring the auction for you! Of course, if your "max bid" is topped, you still have the right to enter a "straight bid" or another "max bid" if you want to stay in competition for the lot. 2) Utilizing "max bids" prevents you from getting caught up in "auction fever". You figure out the most you want to pay for a lot, enter it as your secret "max bid" and walk away. You will either win the lot or not, but your bids will be based on your carefully considered calculations, and not on emotions that can and do bubble up during the auction. Try It You 'll Like It! Make not mistake about it, the utilization of "max bids" is no secret among knowledgable collectors. In every one of our auctions, about half our lots are won by collectors utilizing secret "max bids". In almost every case, the lot is won for less than the secret "max bid" entered, often MUCH less! If you are bidding in our sales, or are too busy to bid, try utilizing the "max bid" option on just one lot. We think you'll find this the most convenient way to participate in our auctions and you just may win a lot that you would otherwise be too busy or unavailable to bid on! Armadillo World Headquarters - A Memoir Recently Published! It's no secret that collector interest and demand for vintage concert posters and handbills from Armadillo World Headquarters have skyrocketed in recent years. This has been reported about frequently in this blog. We're pleased to report that a new book on the legendary venue has been recently published by Eddie Wilson, one of the founders of Armadillo World HQ. The book is highly entertaining and provides music fans and collectors a behind the scenes peak of the club, the world famous musicians that played there, and a historical context of the Austin music scene in the 1970's. In addition to the treasure trove of information and anecdotes, there are many great photos of the fantastic posters that were created to promote the concerts at the venue. Experienced collectors know that information is what drives the growth of any collectibles market. Knowledge, truly is KING. Armadillo material was already sought after and this new book explains why it is high desirable. This is a volume that every collector of vintage concert posters and handbills should add to their library. Highly recommended and well worth the $35.00 cover price! PAE Offers The Ultimate Vintage Concert Poster Price Guide! 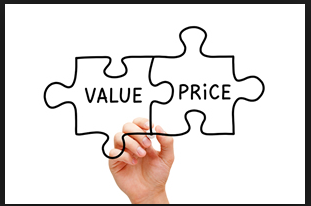 Whether buying or selling, everyone wants to make an informed decision about value paid and received. PAE offers an extensive free Past Auction Results database which is an informative tool that can assist you with your collecting decisions. The database is highly searchable by venue, band, grade, CGC, artist signed,etc. We recommend searching "All" our past auctions for the items of interest. Just enter your search term, hit the "Submit" button and everything we have sold in past auctions is clearly presented including a super high res photo of the lot, description, date sold, and price realized. 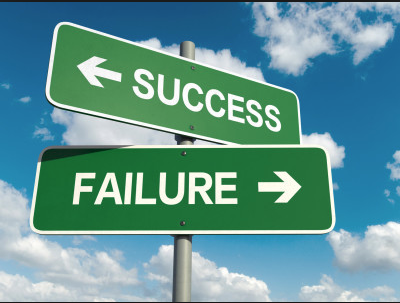 1) Values can and will fluctuate. The same exact poster can bring widely fluctuating prices on different days depending on who shows up at any given auction to bid. In every single auction we conduct, there are some lots that slip through the cracks and sell for way less than should have, or have sold for in the past. Also, in every single auction, will be lots that draw intense interest and keen bidding competition that drives the price realized above what most market observers expect, or above what a comparable item has sold for in the past. This means that if you're looking to acquire a particular item, it may be unrealistic to expect to pick that item up for the same "steal" some other lucky collector previously snagged. Conversely, if you are consigning to an auction, it can be equally unrealistic to think your item will receive the same run away bid that some other consigner enjoyed. 2) Size Matters! (Sample Size That Is) Because values can and do fluctuate widely as discussed in #1, sample size greatly increases the accuracy of valuations. This means that if you have 3-5 previous auction results for a given item, you will have a much more accurate estimation of value compared to if just one previous sale has taken place. 3) Historical Context is Important It's no secret to readers of this blog that the market for vintage concert posters is exploding in popularity. Prices realized years ago can be no more relevant today than what shares of Facebook traded for at it's IPO, or what ocean front homes in Malibu sold for long ago. Values can, and do, go up AND down, and it's important to take into account where the market is NOW, compared to the dates of the previous auction sales you uncover. 4) Small Differences in Condition = Huge Difference in Value When researching past auction results, be sure to take condition into account. In today's quality conscious market, small differences in condition often lead to huge differences in prices realized. When comparing a past sale to a current opportunity to buy or sell, be sure to take this into account. 5) Understand CGC Premiums When researching past auction results, it is critical to understand that the value of items independently authenticated and graded by CGC cannot be fairly compared to items that are not CGC graded. Like every other major collectible such as rare coins, comic books, baseball cards, postage stamps, etc, collectors, on average, are willing to pay HUGE premiums for material that has been independently authenticated and graded. This is because CGC provides an unbiased opinion on condition free from the conflicts of interest inherent in non CGC material, professional restoration that is only apparent to the highly trained eye will be fully disclosed, liquidity is greatly enhanced, the airtight holder is the safest and most secure way to store the material, and many other advantages that have been previously discussed in this blog. If you're buying an item that is CGC graded, do NOT expect to pay the same low price that a ungraded example of the same issue sold for. If you're selling a non graded item, do NOT expect to receive the same high value that a CGC graded item realized. Whether buying or selling, comparing the values of CGC graded material directly to non CGC graded material will lead to disappointment. Adjust your expectations accordingly and be realistic. 6) Collectibles are not Stocks and Bonds - Every item is Unique! When researching past auction results, it's imperative to remember that every single poster is different and every collector has different tastes and opinions about desirability. Because of this, we HIGHLY recommend that you carefully review the description and photo of each item sold and not rely solely an item's grade, date sold and price realized. For example, you can have a poster graded 8.5 that is DEAD MINT except for a single pinhole and another poster graded 8.5 that is free of pinholes but exhibits light overall handling. Some collectors are willing to pay more for the former, others are willing to pay more for the latter. So be sure to take a holistic approach to researching values and be sure to incorporate ALL relevant determinants of value including the most important determinant of all...your own personal tastes! 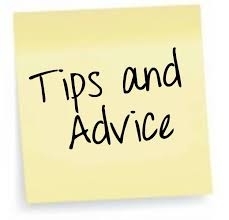 7) When in Doubt Get an Expert Opinion Please know that whether buying or selling, we stand ready to assist you any way possible. Please feel free to contact us with any questions or information you need. You can be confident you'll receive the highest quality information and advice available today! Click here for Past Auction Results! Life Magazine Declares 1968 "The Year That Changed The World"
Life Magazine's new edition celebrating the historical importance of 1968. 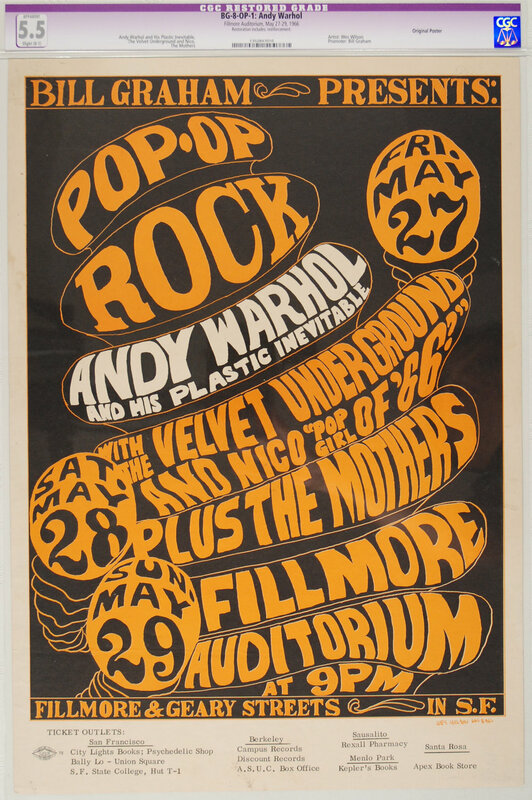 This blog had gone to great lengths to explain the many different factors that have have led to the current explosion in interest and demand for vintage 1960's concert posters. While a long list of positive attributes are now combining into "a perfect storm", no single factor is more important to the attractiveness of this hobby than the historical importance of these posters. Many historians believe that the 1960's was the most important decade of the 20th century. That's why 50 years later the entire world had a year long celebration of the 50th Anniversary of The Summer of Love. And that's why Life Magazine has just published a special 50th Anniversary Edition celebrating the 50th Anniversary of 1968- "The Year That Changed The World". Life's 1968 Special Edition is currently available on newsstands and at the checkout lanes of local supermarkets nationwide. While obscenely expensive ($14.95), the magazine is quite interesting in reviewing everything that happened in just one year: the Viet Nam war, the assassinations of Martin Luther King, Jr and Robert Kennedy, The Apollo 7 mission to orbit the moon, the election of Richard Nixon, peace protests on college campuses nationwide, etc. A story on the art of the times, and how it closely correlated, commented and documented the times-- The Beatles'White Album and their song "Revolution, The Stones' Beggar's Banquet and their "Street Fighting Man", Janis Joplin and Big Brother's Cheap Thrills, Dylan's John Wesley Harding, the musical Hair, and Tom Wolfe's Electric Kool Aid Acid Test-- are also highlighted. There can be no question that these were special times, and this was special art, all of which has had a lasting impact on our world 50 years later. Many collectors believe that vintage concert posters, and their links to this history, are the most compelling and authentic artifacts remaining from this all important era. And it is this historical importance that really anchors the desirability of vintage concert posters and makes them so much more interesting than many other collectibles. One final note: as collectors we often talk about the "The 1960's", the importance of the decade and the desirability of it's concert posters. It's important to remember, that when talking about 1960's psychedelic concert posters, what we are really talking about are posters that were issued primarily in 1966-1969. That's just 4 short years (plus a couple months of late 1965). This represents a tiny fraction of the total universe of concert posters create 1966 to date and explains why posters from the 1960's absolutely deserve the added attention they enjoy and value premiums they command. URGENT COLLECTOR ALERT! CGC Graded Concert Posters Graded 8.5 Offer Spectacular Value! Some Savvy Collectors Are Earning Immediate Profits! Followers of this blog have received extensive information on the many benefits of acquiring vintage concert posters, handbills, and postcards that are accompanied by third party authentication and grading by CGC. The bottom line is that the value of ANY collectible is closely determined by it's condition. And in today's quality conscious marketplace, tiny differences in quality can mean huge differences in price. This creates an inherent conflict of interest between buyer and seller, as sellers have a natural incentive to grade their posters as high as possible. This poster is one of several CGC graded 8.5 items currently being offered at auction, click photo for details! Important Note: CGC does not grade ALL issues, but their universe is expanding quickly. When CGC grading is NOT available, we grade according to our strict standards that can be found on our website, and backed by the guarantee also posted on our website. In general, CGC grading is SUPER STRICT, far stricter than posters have EVER been graded in the past. The result of this strict grading is that the collector receives tremendous, superior value at EVERY grade level along the spectrum. This blog wishes to examine the spectacular value proposition of posters that have been graded 8.5 by CGC. In many cases, material graded by CGC as 8.5 is super clean, with 100% full borders and no nicks, cuts,tears or pinholes. Posters of this quality have had many different adjectives attached to them in the past including "Near Mint" , "Mint", and "Dead Mint", depending on the vagaries and grading scale utilized by each individual seller. This poster is one of several CGC graded 8.5 items currently being offered at auction, click photo for details. But today, thanks to CGC, you can acquire a super clean example graded 8.5, that is virtually indistinguishable to Mint examples, for FAR less than the premiums commanded by material graded 9.0 and higher. Please understand, that this does NOT mean that every poster graded 8.5 by CGC is free of all nicks, cuts, tears, or pinholes. Many pieces graded 8.5 will be perfect except for a tiny nick, or single pinhole. Other 8.5 examples that are free of obvious damage will often have a speck of missing ink or some general overall signs of handling that holds it back from a higher grade. Proof of this spectacular value proposition is frequent reports we receive from savvy collectors that have been acquiring CGC graded 8.5 material, removing it from the holder, and selling it for an immediate profit in other venues where third party grading is not embraced and considered unimportant. The bottom line is that CGC graded 8.5 material is World Class in every way and in our opinion represents the top 2-3% of ALL surviving vintage concert posters. If you are a quality conscious buyer, these posters often offer quality and eye appeal that far exceeds your expectations of the 8.5 numerical grade. If you are looking to get the maximum "bang" for your collecting dollar, this is a grade that should be examined closely. Fifteen different items graded by CGC as 8.5 are offered in our current auction! CGC Graded Concert Posters- To Frame or Not Frame? Every day we speak with collectors that are sold on the safety, security and liquidity that accompanies every vintage concert poster that has been independently authenticated and graded by CGC. This amazing BG-8 CGC graded concert poster has been framed with the holder fully visible. 1) Remove the poster from the holder and frame as usual. The main benefit to buying CGC graded and authenticated posters is you gain far greater confidence that you are getting exactly what you paid for. 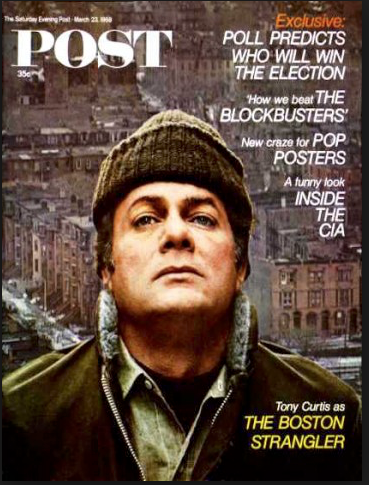 Let's face it, there are many different printings for most issues, there are counterfeit and bootleg posters floating around, and a HUGE percentage of surviving posters have professional restoration that can only be detected by a trained eye. In today's quality conscious market where originality is highly prized, value is directly correlated to state of preservation. Very small differences in quality can mean HUGE differences in price. Given these market realities, why would you want to take someone's word for the condition a poster is in when that person has a direct conflict of interest? That's why PAE has a policy of ONLY selling CGC graded concert posters, if the issue we are selling is currently eligible for CGC's service. Given these facts, there is absolutely nothing wrong with buying a CGC graded poster so you can be confident you are actually getting what you paid for. The poster can then be removed from the holder and professionally framed using museum quality archival materials and procedures. At least with this option, you won't find yourself many years down the road, ready to sell, and find out THEN that you were sold something that was mis-represented. 2) Frame your CGC poster in the holder with the holder visible. A second option is to frame the poster in the CGC holder, with all the information CGC provides fully displayed. Some of our clients tell us they believe the CGC information provided, (Band, venue, date, artists, condition, etc.) adds to the viewing experience. This option is a simple procedure that can be handled by any frame shop. Simply "float" the poster in a larger frame. The advantage of this option is that any frame shop can do it, you will have the security and peace of mind that the poster is protected in CGC's airtight holder, and the poster will command a premium price when it comes tie to sell since it will already be CGC graded and authenticated. 3) Frame your CGC poster in the holder with a mat hiding the CGC holder. A third option is to frame the poster in the CGC holder, but completely hide the holder using a mat. The advantage of this option is that you get the safety and security of the CGC holder while having the same optical experience of framing the poster out of the holder. No matter what you decide, there is no doubt that CGC third party authentication and grading provides tremendous benefits to vintage concert poster collectors. The safety, security and liquidity can all be enjoyed no matter how you decide to display these historic pieces of art. Re-publication of classic 1968 article illustrates the current explosion in the marketplace was 50 years in the making! 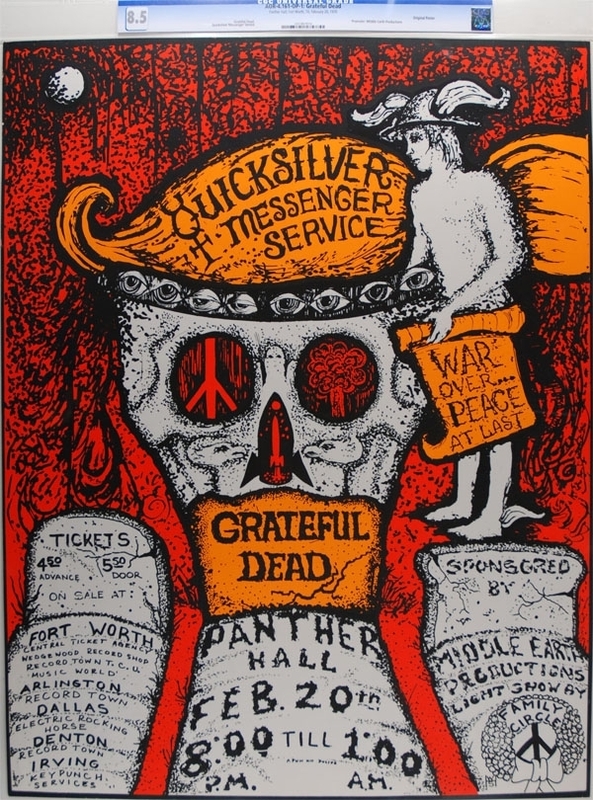 It's no secret to current market participants that the 50th Anniversary of The Summer of Love was hugely successful in exposing vintage concert posters to millions of people that otherwise would not know these incredible artworks still exist and are highly collectible. A few months ago, the Saturday Evening Post re-published a cover story on 1960's concert posters that was originally published in 1968. (The original 1968 cover is pictured here.) The article underscores the fact that these posters are authentic pieces of history from what many consider to be the most influential decade of the 20th Century. Unlike coins, stamps, comic books and baseball cards, these posters were created in editions of hundreds or thousands....not hundreds of thousands, millions or tens of millions! Also, unlike sports cards and comic books, vintage concert posters were not created to be saved. Concert posters are authentic historical artifacts, NOT manfactured rarities. The bottom line is the current recognition and explosion in popularity of vintage concert posters amongst collectors is well earned and just the latest chapter in a story that is now over 50 years old! Rare Dracula Movie Poster Realizes World Record $525,800! Further proof Vintage Concert Posters represent most lucrative collectibles opportunity in the world today! 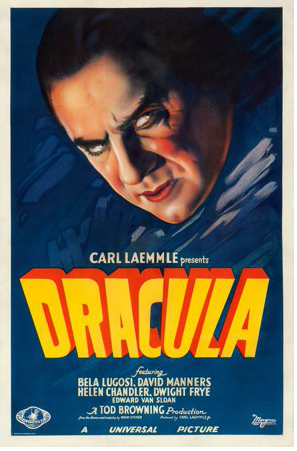 Vintage movie posters made national headlines in November, 2017 when a 1931 Dracula poster realized $525,800 at auction - the highest price ever paid at public auction for a movie poster. Five other movie posters realized over $200,000 and over a dozen realized over $100,000 in 2017. These record breaking prices serve as further proof that vintage concert posters represent the most lucrative collectibles opportunity in the world today. Experienced collectors understand you can still acquire the rarest, the most beautiful, and most historically important concert posters --in Museum Quality condition -- for literally pennies on the dollar compared to other collectibles. In a world where the most desirable comic books, baseball cards, coins and stamps routinely realize over $ 1 million each, you can still collect the very best concert posters for $5,000 and up. And miraculously, there are still many dozens of concert posters that are 45+ years old, featuring famous bands and venues, in pristine condition, that can be purchased for well under $1,000! Clearly, our market represents a powder keg that is in the process of exploding. 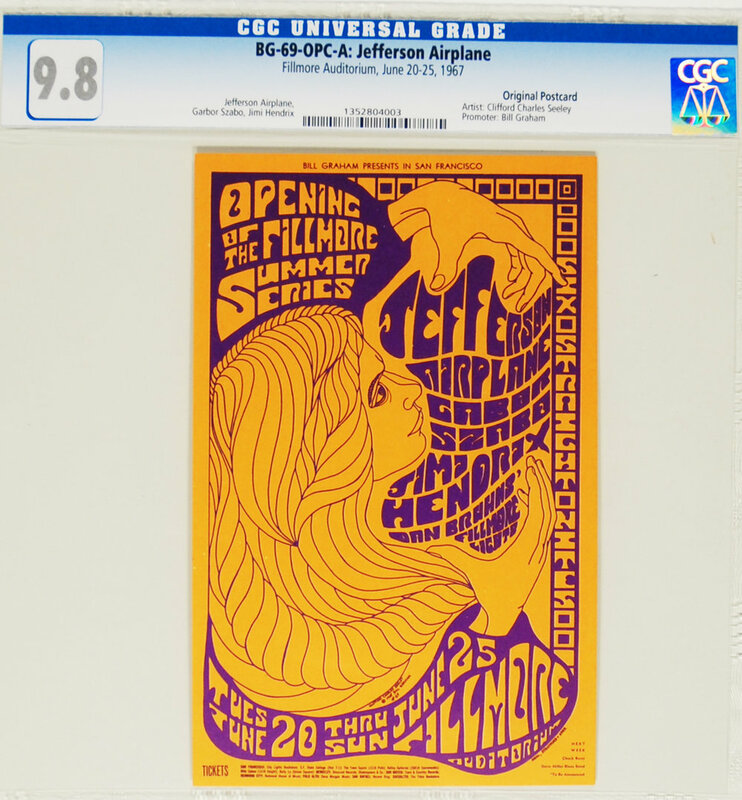 Third party authentication and grading, the publication of a major collector's guide, the recent 50th birthday of the collectible and major media and museum exposure --all documented in previous blog posts here-- have allowed vintage concert posters to finally take center stage. That's why PAE gained over 400 new clients in 2017 alone! It's not often in life that you get exposed to true ground floor opportunities before the rest of the world finds out. How lucky we all are to have discovered these rare and beautiful pieces of history that can still be acquired in Museum Quality condition for a tiny fraction of what many collectors expect them to be worth in the future. Collecting vintage concert posters is fun, exciting and affordable! 10 Predictions for Vintage Concert Posters in 2018! Here's what we see happening next! As previously discussed, the marketplace for vintage concert posters is evolving at light speed. Be cognizant of the following market trends when planning your own collecting activities. 1) Record Prices fo the Finest and Rarest! Increased demand and dwindling supply will lead to record prices across ALL categories. The current market environment has collectors paying up for both TOP QUALITY and TOP RARITY. This means the finest known example of a $100 poster is just as likely to draw a record price as a one of a kind $25,000 rarity. In the few instances where a top quality example of a super rare item surfaces, expect fireworks to happen! Will 2018 see the first $100,000 concert poster at auction? 2) The Number of Market Participants Multiplies...Again! This is a market that clearly has the wind at it's back. 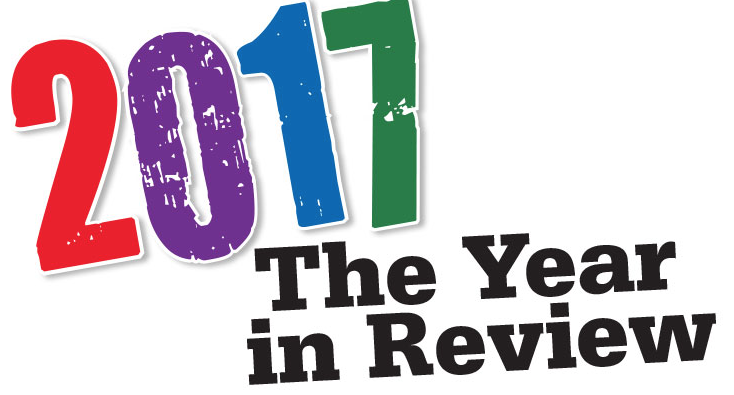 (See 2017 year in review blog post for reasons why) At PAE, our goal is to bring at least 1000 new clients onboard. This would be more than double the 450 new clients we welcomed in 2017. It's a big goal, but we are committed to more than doubling our annual market expenditure to to reach our goal. 3) A Focus on Tangible Assets Will Fan The Flames. The White House is committed to spending money like a drunken sailor. This is already leading to a fall in the dollar and a rise in gold. What does this have to do with vintage concert posters? Plenty. This is the very beginning of a cycle of renewed inflation and desire for "hard assets". Collectible ALWAYS are the number one beneficiary of this type of environment. 2017 was year of growth for PAE, growth in clients, growth in volume and growth in staff. In addition to our two principals, Glen and Scott, we now have 2 full time employees and 3 part time employees that each log about 20 hours each. We are actively searching for more staff and if you are in the area and love this material and interested in joining our team, please let us know, IMMEDIATELY. 5) Severe Supply Shock Hits Market. There's a sound in the marketplace that started 2017 off as a murmur but has slowly grown into a roar. We're talking about a giant sucking sound of rapidly dwindling supply that has become pervasive in the marketplace. Through the decades there have been various stashes of posters that were never "put up" and that served as a ready source of supply that could help quench the thirst of any new demand. The very last of these stashes are quickly becoming extinct. This is quickly resulting in a heightened appreciation for virtually ANY 1960's concert poster that has survived the past 45-50 years. This major market inflection point, well understood by long time observers, will become common knowledge among all collectors and will greatly effect values in 2018. 6) Premiums for Artist Signed Material Explodes. This is a trend we have seen steadily gaining steam over the past several years and we see an acceleration of this trend in 2018. Let's face it, the artists of the era are not getting any younger. 20 years ago, an artist signed poster was no big deal. Now that these artists are in their 70's, the ability to acquire their signature on a poster is a much more highly valued opportunity. As it should be! 7) Interest in Grande Ballroom, Vulcan Gas and Armadillo World HQ Posters Climbs. As more and more collectors enter the marketplace, interest will gravitate to areas that are currently under valued. Over the past 2-3 years we have seen an explosion in interest for all three of the venues listed above. These venues issued posters of incredibly high artistic value, in extremely limited quantities, for a very dedicated psychedelic communities outside California. Importantly, major new books have also been recently published on these venues. In many cases these posters can be acquired for a fraction of what the more well known posters out of California command. Experience dictates that market inefficiencies like this can't last forever and this one won't either. Take advantage while you can! Let's face it. High quality examples of posters in CGC graded holders are on average, worth a huge premium to the same issue that has not been third party authenticated and graded. Up until now, CGC has not had the capabilities to grade the large size Fillmore poster, but this situation is about to change. Look for these massive posters to command substantial premiums once CGC commences grading in the coming weeks! And of course, the larger a poster is, the harder it is to preserve in museum quality condition! 9) Values of Large Size AOR Posters Explodes. CGC is currently committed to grading and authenticating all poster in the Art of Rock. The exception was large size posters that required a new holder that will be launched in coming weeks. Look for all AOR posters that have not yet been eligible for CGC grading to explode upwards in value when placed in CGC holders. There is a huge pent up demand for these issues to be available with CGC grading. It's no secret that a concert handbill is far easier to counterfeit than a concert poster. Third party authentication and grading by CGC has brought much needed integrity to this overlooked area of the market. With the introduction of CGC, we have seen an explosion of interest in concert handbills, now that collectors can acquire them with confidence. In addition, CGC has devised a wonderful holder for concert postcards, that includes holes that can easily be used with a binder. Collectors LOVE the CGC concert postcard product as you get the same iconic art, the same historical importance, a system to display a collection, all for just pennies on the dollar compared to what the very same posters command. This is a trend that has nowhere to go but UP! Overstreet Shifts Vintage Concert Posters into Overdrive! Overstreet Guide to Collecting Concert Posters adds more fuel to fire up a market that is already burning bright! ! Collectors and investors will certainly look back on 2017 as a year of major growth for vintage concert posters. Thousands of new collectors are entering the field due to a confluence of circumstances that will be outlined in our upcoming year in review. This exponential growth has led to predictable results including record prices, an increased focus on original, unrestored posters and a greater appreciation for the historical importance and relative rarity of pristine, undamaged vintage concert posters. 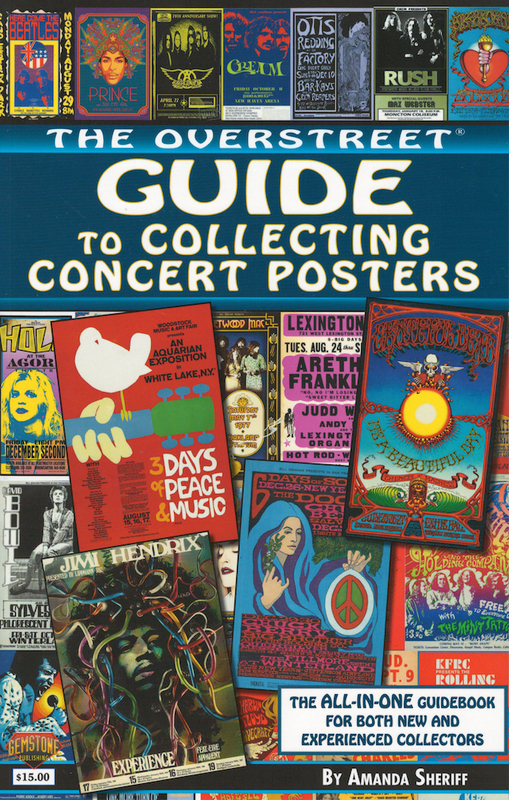 The recent publication of The Overstreet Guide to Collecting Concert Posters provides more tangible proof that vintage rock concert posters have become a major collectible area with mainstream appeal! The importance of this publication cannot be overstated. Overstreet is a major collectibles publishing house that is solely focused on collectibles that have broad, mainstream appeal! The reason this new Concert Poster Guidebook exist is because Overstreet's marketing team has identified a world wide demand for information on this exploding collectible market segment. Overstreet is a trusted source for collectibles information. Millions of collectors are very familiar with the Overstreet Collectible Guides, particularly in the comic book and movie poster markets. Overstreet guidebooks are distributed internationally, online, at every major bookstore, and across the counter at over 3000 comic book stores across the United States. This now Concert Poster Guidebook will now become the most widely promoted book on concert posters ever produced! The Overstreet Guide to Collecting Concert Posters is sure to provide an introduction to thousands of new collectors in 2018, and in each year beyond. The 267 page, full color guidebook includes artist biographies, stories on the classic venues, tips on storage, a detailed look at the historic impact of CGC's third party authentication and grading and much, much more! Every major collectible- rare coins, stamps, comic books, baseball cards, paper money and countless others have their recognized Guidebooks. Besides being an introduction and source of information, these Guidebooks provide a legitimacy that interest in these collectible markets are widespread and "real". The publication of The Overstreet Guide to Collecting Concert Posters marks yet another major step forward for our remarkable hobby. 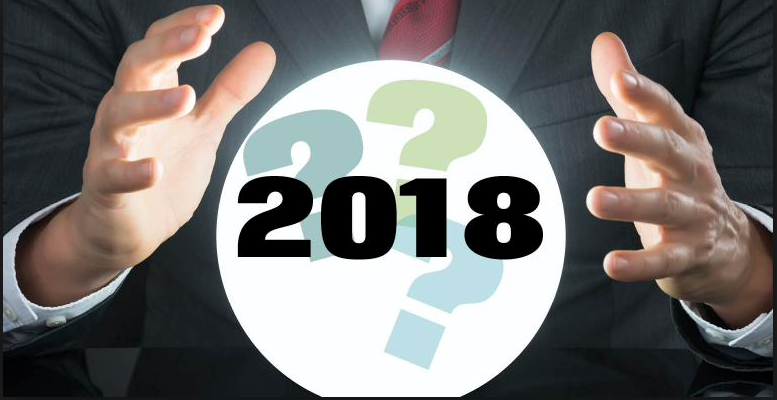 The positive repercussions are sure to be felt in 2018 and each year beyond! Owning this historic Guidebook is a must! Vintage Concert Poster Market Explodes in 2017! 2017 was a year-long celebration of the 50th Anniversary of The Summer of Love. An event that was 50 years in the making transformed the importance and historical significance of vintage concert posters overnight! Suddenly, exhibitions of vintage concert posters began popping up at major ART MUSEUMS all over the world. More importantly, these exhibits were insanely popular and attended by huge crowds eager to be transported back to a magical era in our nation's history. See previous blog posts for detailed reviews of last year's major museum exhibits. 2017 will forever be remembered as the year the marketplace embraced third party authentication and grading by CGC. Like every other major collectible area such as rare coins, stamps, currency, comic books and baseball cards, third party CGC grading has allowed collectors the opportunity to buy with confidence, knowing that they are getting exactly what they paid for. In April 2017, Psychedelic Art Exchange announced that every single poster and handbill we sell will be accompanied by CGC grading and authentication, if that item is eligible for CGC's service. (CGC does NOT grade and authenticate all issues yet). This decision was made to further our goal of providing the most trusted platform for both buyers and sellers who are looking to participate in this exploding field. Since condition is a huge factor in determining value, it seems logical to have an unbiased third party opinion, when available. See previous blog posts for a more detailed nuanced discussion on the repercussions of CGC grading. The two factors above led to remarkable growth in the number of participants in the marketplace. PAE is pleased to announce that we gained over 450 new clients in 2017. These new clients are really excited about collecting these posters and share our belief that 1960's vintage concert posters represent the most exciting opportunity in the collectibles marketplace today! It's no secret to anyone that the huge growth in collector demand that was chasing the fixed and dwindling supply of premium material led to a dramatic rise in prices, with many records having been smashed. Despite these price adjustments, the hundreds of new collectors we are dealing with fervently believe this is still early days. Because the very finest and rarest concert posters in existence can still be bought for $10,000-$50,000. When you compare this to the millions of dollars that collectibles in other markets of similar rarity and desirability command, you can appreciate what a spectacular bargain vintage concert posters still represent. In addition to increased values, there has been a massive increase in the liquidity for premium material. We literally have over $1,000,000 in Want List items and stand ready to pay immediate top dollar for anything desirable you may wish to sell. If you're a seller, there's never been a better time to cash in. Contact us immediately and you can have your payment TOMORROW, without enduring the waiting or risks of auction consignment. We buy complete collections. We do not pick and choose. And the bigger the deal, the better we like it!! Call or email us NOW! All of the factors listed above insure an exciting and fun 2018 for both buyers and sellers of vintage concert posters. We would like to thank everyone for their loyal patronage and the the trust you have bestowed upon us. A future blog will reveal some predictions of what we see ahead. and some big plans for future growth at PAE. 5 Reasons to Get Your Concert posters CGC Graded & Authenticated Right Now! Third party CGC grading and authentication offers an opportunity where you have everything to gain and nothing to lose. This blog examines why it is imperative to get any posters you now own graded and authenticated by CGC right now. And why any new acquisitions you make should be CGC graded and authenticated, if at all possible. This poster was sold to a consigner as 100% Original and unrestored. This was false. 1) CGC Discloses Hidden Restoration. As with all collectibles, collectors are willing to pay premium prices for 100% Original material that is in superb condition with no restoration. In every one of our auctions, you will find posters that have been restored. In almost all cases, these are posters that were sold to our consigners as original, unrestored pieces. Modern restoration techniques can be all but impossible to detect. Tears can be restored and pinholes can be filled in. Why not find out now if the posters you own have been accurately represented. You may not think this can happen to you, but every single day we have to break bad news to collectors. Most of these collectors are willing to take their lumps and chalk it off to a class at the school of hard knocks. Those are the posters you see as restored in our auctions. Others tell us to ship the posters back so they can remove them from the CGC holders and sell them in other venues where CGC authentication and grading is not considered important. This poster was sold to a consigner as an Original First Printing.It is not. 2) CGC Discloses Mis-Attribution. It can often be difficult to tell the difference between an Original First Printing and a Reprint. Many times the differences can only be determined by a seasoned expert. In every auction, we have reprints that were sold to the consigners as Original First Printings. The difference in value between the two can be monumental. We believe it's better to be safe than sorry. And like the consigners mentioned above in #1, some choose to take their lumps and sell the posters as reprints in our auction. Others ask for the posters back so they can be removed from the holders and sold in other venues. This poster, while super clean, failed to get a 9.0 or better grade. It was purchased by our consigner as "Dead Mint". 3) CGC Provides Unbiased Opinion About Condition. Like all collectibles, for any specific issue, value is based largely on condition. The same poster can be worth multiples of the same issue in a lesser state of preservation. Given the price differences for small differences in quality, why not have an unbiased opinion from someone that doesn't have any skin in the game? Every auction we feature items that were originally sold as "Near Mint" or "Mint". While these posters may be very clean, some are still graded 8.0 or 8.5 by CGC's very conservative standards. If you pay for a premium quality poster, you might as well be assured that you are receiving what you bargained for. 4) CGC Provides an Immediate Boost in Value to your Collection. Hopefully the posters in your collection are all accurately graded, correctly attributed and free from undisclosed restoration. If this is the case, then CGC grading and authentication will provide an immediate boost in value and liquidity to your collection. Demand is rapidly growing for CGC graded material. Many the collectors that we deal with demand CGC grading and authentication for any contemplated acquisition as long as it is an issue that CGC currently offers the service. In other collectibles markets, it's all but impossible to sell an item without third party authentication and grading. Most collectors see no reason to risk their hard earned money.This trend will continue to grow with each passing day. 5) CGC Creates Opportunities Make no mistake about it, many collectors are very happy to buy non CGC graded material. Every day we deal with experienced collectors that are snapping up gem quality material from sources they have cultivated and trust and that have proven to be reliable over time. These posters are then sent to CGC and are instantly worth more and are more liquid. This is possible because in the great majority of cases, a poster without CGC grading can be acquired for less than posters with CGC grading due to all the risks outlined above. If you are an experienced collector that has sources to buy properly attributed material with out CGC grading, and you have verified this by submitting their material to CGC, then these sources can provide lucrative arbitrage opportunities. Our advice would be to buy all you can while this window of opportunity remains open. If you are new collector that has not yet acquired years of experience and expertise, then CGC third party authentication and grading allows you to participate with with confidence in this exploding new marketplace. 6) The Bottom Line The bottom line is very simple. Submitting your posters to CGC is an opportunity where you have everything to gain and nothing to lose. If your material has been correctly represented, you will enjoy an immediate premium that CGC commands. If you have acquired material that has been mis-represented, then it's better to know now, before you throw good money after bad. Either way, you will be in a better position to take advantage of what many experienced collectors believe is the most lucrative and exciting collectible opportunity in the world today! Uber Poster Collector David Swartz Featured in the New York Times! World famous concert poster collector David Swartz was recently the subject of a feature article in The New York Times. This article is important for two main reasons. First, the very fact that The New York Times, the most important newspaper in the world, decided it was relevant to report on vintage concert posters, is very encouraging. We’ve been reporting extensively about how main stream media has steadily arrived at a newfound respect for the historically important works of art. Secondly, the advice that Mr. Swartz shares is literally priceless and the product of participating in the marketplace for over three decades. We recommend that you read this article slowly—TWICE. The key takeaways we get from the article – and from our dealings with Mr. Swartz as both a client and a friend -- are as follows. First, be passionate. Mr. Swartz achieved incredible, multi-million dollar success because he LOVES the material he collects. In the article, he speaks about “the thrill of the chase.” But at the same time, he is disciplined. If an item doesn’t speak to him, he isn’t interested at ANY price. Be knowledgeable. Mr Swartz understands that knowledge is king. In the article he calls his hobby “a research game.” He has relentlessly pursued the details, the nuances and the history behind these incredible posters. And he never stops learning. Think long term. Mr. Swartz is not a here today, gone tomorrow kind of guy. His attention is never diverted. He understands that it takes time for the compounding of his knowledge and the compounding growth of the marketplace to work in his favor. His patience has paid off – BIG TIME. Lastly, be prepared to act. Every experienced collector in this marketplace has a “David Swartz story” where they were beat out on acquiring an item that he also desired. The article itself speaks of Mr. Swartz’s collecting activities as a “competitive search.” When Mr. Swartz’s patience and knowledge lineup just right, and provide him with an opportunity that he knows, as the article states, is “unique or special”, he is willing to act with incredible speed and decisiveness. He understands that some opportunities can take many years to repeat themselves—if ever. And if they do, it’s inevitably at much higher prices down the road. The Greatest 1960's Concert Poster Museum Exhibition of All Time is Happening Now! We are still digesting everything we witnessed at the Summer of Love Experience that is on display at the deYoung Fine Arts Museum in San Francisco through August 20, 2017. First, let's talk about the exhibit itself. The Summer of Love Experience is without a doubt the finest museum exhibition dedicated to the historical importance of 1960's art, music, fashion and politics ever created! This exhibit is truly breathtaking in it's size, scope, ambitions and unparalleled professionalism. Over the years, we have enthusiastically reported on major museum exhibits that have regularly popped up around the the United States. We have explained that these exhibits bring newfound respect and exposure for the posters that we all lovingly collect and admire. These exhibits have all been hugely important, but this exhibit is 10 times better than any that have come before it. The Summer of Love Experience runs through August 20, 2017. We HIGHLY recommend that as a reader of this blog, you strongly consider investing the time and money needed to see this with your very own eyes, even if you are from out of town. You will NOT be disappointed and a thorough review of the exhibit can easily take up a couple of hours. We're pleased to report that while this massive exhibit offers very extensive and highly detailed displays of 1960's fashion, and social and political happenings, it is the concerts and music posters from the 1960's that absolutely take center stage and are THE focal point of the exhibit! Literally hundreds of 1960's posters are beautifully and respectfully presented. A 4 minute movie shows you how these incredible pieces of history were created. Printing plates and artist's original handwritten instructions to the printer are shown and explained. An entire section of the exhibit is dedicated to The Trips Festival. You can step into a room and see dozens of people mesmerized by Bill Ham's light show! Obviously, 1960's music is played throughout. Entire sections are also dedicated to The Human Be-In, The Merry Pranksters, Haight Ashbury snd the bands and artists of the era. One of the most impressive displays was of Victor Moscoso's posters shown under the influence of a color wheel, exactly as they were intended to be viewed. Believe me, you have not truly seen a Moscoso concert poster until you have seen it the way it was intended. Absolutely incredible! The most important thing. Without a doubt, the thing that impressed us the most about this exhibit was the mind boggling size and enthusiasm of the crowds attending. There was around 1000 people at the exhibit during our 3 hour visit. A back of the envelope calculation leads us to believe that at the very least, half a million people will see this exhibit during it's 4 months of operation. And it would not surprise us if the total attendance exceeds well over 1 million! It was so clear during our visit that this era, and it's music, art, fashion, and ideals touched people in a way that todays' modern commercialism and way of life does not. For the few hours you spend at the exhibit, you are transported back to a special moment in time and history. The most tangible link to that era is the music, and the most collectible artifact from that era are the posters. Over the past 2-3 years, we have seen a steady and growing number of new collectors that are fascinated by the fact that you can get a historically important, museum quality poster, issued in extremely tiny quantities, for far less than the dreck offered at the "Art Gallery" in your local shopping mall. And even more importantly, these posters currently trade for pennies on the dollar when compared to the finest coins, comic books and baseball cards that routinely bring over $1 million each! It's truly exciting to have a poster in your home that was actually displayed in a museum! Groundbreaking major museum exhibits like this have the same effect as throwing gasoline on a fire. It's obvious this Summer of Love Experience will generate more new collectors of these posters. But more importantly, the massive success of The Summer of Love Experience will serve as an eye opener for other major museums that are always on the lookout for the best way to attract the general public. You can bet there are many more major museum exhibitions to come! This virtuous cycle assures that the appreciation for these beautiful and rare works of art will continue to grow with each passing year. To see the de Young's online exhibit, click here. To buy the Summer of Love Experience museum catalog (HIGHLY recommended! ), click here. To read the San Francisco Examiner review, click here. Exponential growth of new customers. During the first half of 2017 we’ve seen a huge influx of collectors that entering this market for the very first time. These are folks that are already active collectors of rare coins, comic books, baseball cards and other popular collectibles. They understand and are familiar with the advantages of third party grading. Widening premiums between grades. Now that CGC is grading concert posters, we are starting to see a widening of values between each individual grade. This should be a surprise to no one. The very purpose of any grading service is to distinguish differences in quality among examples of the same issue. Once these differences are established, common sense dictates values will be differentiated as well. Record Prices. The influx of experienced collectors from other markets is steadily producing world record prices for the highest graded and finest known examples of various issues. This is simply the result of growing demand and a fixed supply. The market has greatly increased the number of market participants, and these participants have greatly increased confidence to “pay up” when a special opportunity presents itself. While prices are just beginning to increase, premiums for high grade material continue to be a tiny fraction of what is commanded in every other collectibles market. Really great coins, comic books and baseball cards regularly bring over $1,000,000 each while the very rarest and finest quality vintage concert posters don't six figures at auction. Clearly, this is STILL VERY EARLY days for these wonderful pieces of art. Huge media attention. In addition to the structural market factors previously discussed, this market is also growing fast due to huge tailwinds generated by the media. The 50th Anniversary of The 1967 Summer of Love has been extensively reported on and celebrated across the country. TV specials, concerts, museum exhibits and other special events commemorating 1967 continue to be enjoyed by literally millions of people around the world. A perfect storm. All of the factors discussed i the past 2 blog posts have created a perfect storm that has been over 50 years in the making. It’s really exciting to be a participant in this marketplace at this unique moment in time. Massive events are being held around the world in appreciation of the historical importance of the music and culture of the late 1960’s. Vintage rock concert posters are the most tangible and collectible historic artifacts of this era. They are also beautiful, rare and dirt cheap compared to every other collectible. We recommend filling out your collection now, while most issue are still super affordable. Intense Focus on Quality. One of the signs this market is starting to mature is a heightened focus on state of preservation. Even though quality is the number one value determinate of every other major collectible such as coins, comic books, baseball cards, stamps,etc, this concept is still relatively new among vintage concert poster collectors. It wasn’t that long ago that mint condition posters brought very little premium compared to damaged examples. Collectors now recognize that the percentage of posters that have survived in mint condition represent a miniscule fraction of what was originally produced. The competition for these beautiful Gems has really begun to heat up because knowledgeable collectors understand that the premiums commanded in today’s market for mint condition are STILL just a tiny fraction of what is commanded in every other collectible. These collectors believe this situation is temporary-- so the race is on to assemble mint condition collections while prices are still dirt cheap. Intense Focus on Originality. Up until a few years ago, collectors would think nothing of taking a 100% original concert poster with minor problems and have it “improved” through restoration. This situation has changed drastically and has now also fallen in line with other collectible markets. Today’s collectors are focused on 100% original posters with no restoration. Most collectors we deal with would rather have a poster that is 100% original and completely “unmessed with”, than have a poster in their collection that has had paper added to fill in pinholes or ink and color added that was not part of the original poster. The thinking can best be summed up this way: When it comes to restoration, where do you draw the line between owning “the real thing” versus owning something that is “not 100% real’? The answer to this question must be answered by each individual collector for themselves. But collectively, the people and the marketplace have spoken. Today’s collectors are focusing on 100% original posters with no restoration. Values and demand for original posters are growing faster than those of comparable restored examples. Widespread acceptance of CGC. Independent authentication and grading by CGC is a market development that was inevitable and long overdue. In today’s fast growing market for vintage concert posters, small differences in quality represent large differences in value. This generates an inherent conflict of interest between buyers and sellers that results in several problems. First, the seller, naturally, is incentivized to grade their posters as high as possible in order to sell it for as much as possible. Second, just because the dealer you buy a poster from grades it a certain way, that is no guarantee that anyone else will agree with that grade when the time comes for you to sell. Third, if you have a really superior “finest known” example of a poster you wish to sell, it will be hard to realize the extra value that is inherent in the quality of your item without independent verification. Fourth, if you have a poster you wish to sell that is not CGC graded, no dealer can give you an accurate quote without in person inspection. Lastly, if you are new to a collectible field, you won’t have the expertise or knowledge to determine for yourself whether a poster has been professionally restored or if it the actual printing (or reprint) that it is represented to be. 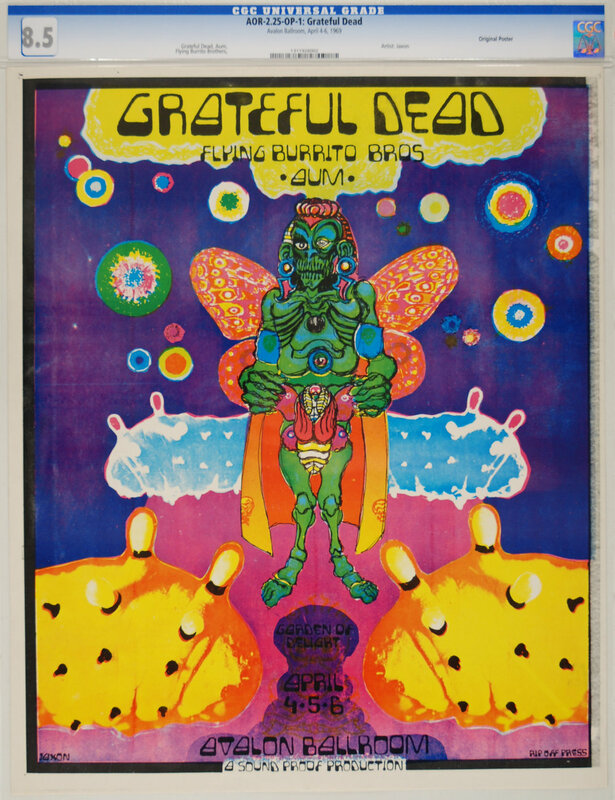 Psychedelic Art Exchange believes that third party authentication and grading by CGC is a major leap forward for collectors of vintage concert posters and handbills. CGC is an internationally recognized leader in third party authentication and grading of collectibles. They have graded literally BILLIONS OF DOLLARS of rare coins, comic books and rare currency over the past 20+ years. We have made the decision that if a poster is eligible for CGC grading, we will ALWAYS have it submitted to CGC before it is offered for sale. (Unless the poster is of negligible value under $100) Why? The answer is really simple. We want to be on “the same side of the table” as our loyal and highly valued clients. And we want to offer a safe and secure platform for collectors to CONFIDENTLY buy and sell. In other words, we believe that by doing what’s in the best long term interests of our clients, we are actually doing what is in the best long term interest for our company and the marketplace as a whole. It’s an old fashioned idea that often gets lost in today’s fast paced world. Currently, CGC grades all of the posters featured in The Art of Rock by Paul Grushkin, (subject to size constraints), and all of the posters in The Collector’s Guide to Psychedelic Rock Concerts Posters, Postcards and Handbills, 1965-1973 by Eric King. (Again,subject to some limited size constraints). Mr.King’s encyclopedic Guide features the entire concert poster series from the Family Dog Avalon Ballroom, Bill Graham Fillmore Auditorium, Grande Ballroom, Neon Rose and Vulcan Gas. CGC has announced that in the future they will continue to expand the universe of posters eligible for their service. If a poster is not currently eligible for CGC grading, we will offer it in a PAE certified package similiar to CGC, as we have for the past 10 years. Every PAE certified item is backed IN WRITING by a Lifetime Guarantee of Authenticity and Grade. It’s not a perfect solution, but it’s the strongest guarantee available anywhere in the world and it’s a guarantee that has earned us a loyal clientele around the world before CGC grading was introduced. One final note. CGC grading is a new market development and just a tiny fraction of the posters that have survived the past 50 years have been CGC graded and authenticated. Just because a poster does not have CGC grading does NOT mean there is anything wrong with it. Like all collectibles, it’s simply a matter of the condition you receive and the price that you pay. Are you knowledgeable enough to tell an Original First Printing from a reprint? Are you experienced enough to detect expert restoration that can be almost impossible to detect? Are you confident enough to “pay up” for a high condition example based on the opinion of the person selling it to you? Do you know collectors that will pay YOU top dollar for your collection based on solely on your opinion? Certainly, we know many experienced and sophisticated collectors that are regular readers of this blog that can answer “Yes” to these questions. But the great majority of today’s market participants would be better served, for all of the reasons outlined above, to stick with posters that have been independently authenticated and graded by CGC. Third party grading is the defacto standard in every other collectibles market, and the numerous advantages are now readily available to any collector of vintage concert posters that seeks them out. Part 2 of this market update will be posted 7/13/17. CGC Concert Posters Bringing Record Prices! This Jefferson Airplane/Jimi Hendrix (BG-69) Fillmore Concert Postcard CGC graded 9.8 sold for a record $357 in our auction earlier this year! The collectibles marketplace is buzzing with the news of greatly increased activity and record prices that are being recorded for Vintage 1960’s Concert Posters that have been independently authenticated and graded by CGC. CGC does not currently grade every concert poster ever produced. However, every poster eligible for independent authentication and grading will be submitted to CGC prior to sale or auction by Psychedelic Art Exchange. Psychedelic Art Exchange has seen a huge influx of new collectors that are entering the market. These collectors are already knowledgeable and familiar with CGC and independent third party authentication and grading. CGC has graded literally BILLIONS of dollars worth rare coins, comic books and paper money. There services are so ubiquitous, that NO SERIOUS AUCTIONS are held for the aforementioned collectibles without third party authentication and grading! After all, why would a buyer want to “take the sellers word for it” when it comes to condition, especially when small differences in condition can mean such huge differences in value? This beautiful Monterey International Pop Festival Concert poster CGC graded 9.6 sold for a record $4611 in our auction 2/17. However, for collectors of Vintage Concert Posters, the advantages of third party authentication go way beyond this basic leveling of the playing field of buyers versus sellers. First, Vintage Concert Posters have been can be broken up into two main categories, Original Printings that were produced before the concert, and Reprints that were released after the concert. The differences in value between Original Printings and Reprints can be huge, but the differences in determining a Reprint from an Original can be miniscule. CGC authentication solves this problem and allows the new collector to acquire these beautiful pieces of art with confidence, knowing they are getting exactly what they pay for. Secondly, there is the matter of restoration. In every collectibles market, a premium is placed on Originality. Many Vintage Concert posters have been expertly restored to “look Mint” and this restoration can be hard for the begging collector to detect. CGC solves this problem too. 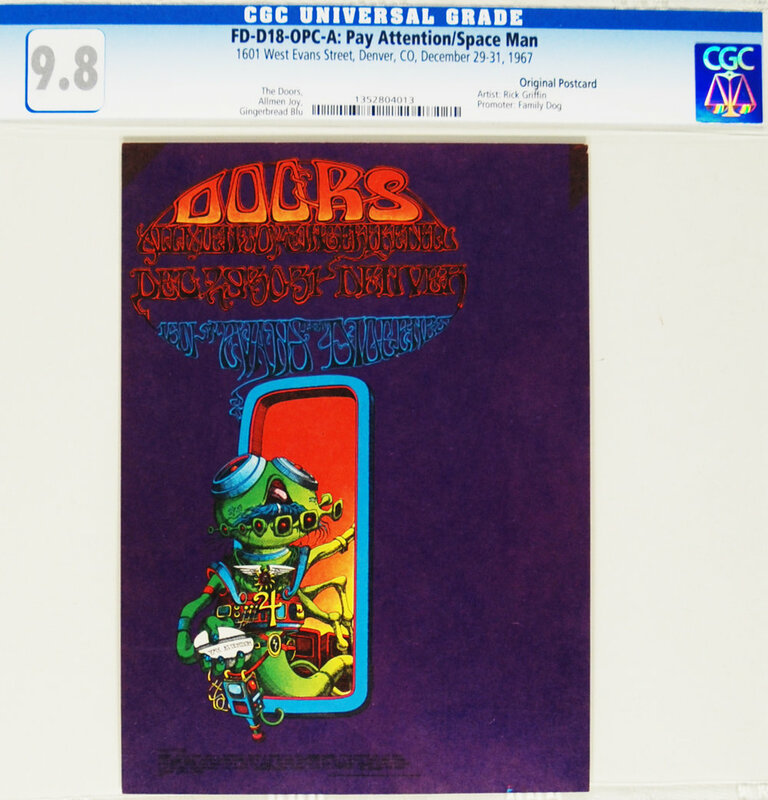 This beautiful Doors Concert postcard (FD-D-18) CGC graded 9.8 sold for a record $241 in our recent auction. The bottom line is that CGC has broken down the barriers and removed obstacles that have prevented new collectors from entering this exciting field. These new collectors already understand how quality and rarity effects value. They understand these posters are historically important. They understand these posters were ssued in numbers of just hundreds or a few thousand, compared to the millions of coins, comic books and baseball cards that are regularly produced for just a single issue.They understand that paper is fragile and that a tiny percentage of the original issuance still survive today, 50 years after they were released. They understand that the premiums commanded for the very best quality pieces are incredibly small compared to other collectibles. They understand how to research and buy collectibles over the internet and at auction. Most importantly, these new collectors understand that with independent, third party grading, they can use their skills and knowledge to participate in what many are calling the most exciting collectibles opportunity in the world today.They understand they can acquire a large, World Class collection for a fraction of just one major rarity in other collectible markets. This influx of new collectors is now eagerly snapping up whatever CGC graded concert posters and handbills that become available. This growing demand is overwhelming the tiny available supply. And that's why prices are moving up at this time. Stay tuned for future blog posts that will examine exactly which Vintage Concert posters these new collectors are targeting for acquisition. Free Appraisals for Vintage Concert Posters! How to find out what your vintage concert posters and handbills are really worth. Every day we receive calls from around the world, asking us what their vintage concert posters and handbills are worth. There are many different answers to this question, depending on the actual information the collector is seeking. Let’s start at the beginning. First, it must be understood that with every collectible, condition is a major determinant of value. The same exact poster can be worth wildly different amounts. A rare poster that is heavily beat up, with multiple tears, tack holes and paper missing can be worth $1,000, while the same issue could be worth $10,000, if it is in flawless museum quality condition. This situation becomes even more complicated at the higher end of the quality spectrum. A very rare poster that has just one tiny flaw such a single pinhole, or ¼ inch tear, could be worth $3,000, while the same issue without that single tiny flaw can be worth $10,000. This means that ALL vintage concert posters and handbills have to be inspected in person, by a trained expert, in order to get a meaningful valuation. Secondly, there are several different valuations that can be ascertained. First, there is “Book Value”, which can be determined by past sales data. Book Value tells the collector what the poster has traded for in the past. This number can be a guide for the collector, but Book Value still has it’s limitations. For example, if a poster sells at auction for $2,000, the collector must understand that there are fees involved in selling. The consigner of the poster would have received $1500-$1600 for the poster, after having waited several weeks or months for the auction to be conducted, and for the money to be collected. While this is not that big of a deal when it comes to one single poster, the deduction of these selling fees can really add up when you are talking about a large collection of many items. Also, the $2,000 gross number pertains to a sale that has already happened at a specific date and time in the past. Like any market, conditions are fluid and this same poster, if put back on the market, could bring $1500 next time…or $2500. The point is, while past auction data provides an excellent base of information for valuation, it does not tell the collector what they can definitely receive for their posters right now, TODAY. The second type of valuation is often referred to as an “Insurance Appraisal or Valuation”. This type of valuation refers to what it would cost to replace a vintage concert poster if it was lost or stolen. An Insurance Appraisal has the same challenges a Book Value appraisal, only in reverse. Just because a poster in your collection brought $2,000 in a past auction, that in no way means it can be replaced for that amount. In many cases, vintage concert posters and handbills are so rare, that it can be several years before another one becomes available for purchase, in equal condition. It’s anyone’s guess when, where and for how much that poster would cost you to replace! Even more complicated are unique, one of a kind rarities. These pieces are literally priceless, as they only trade when a willing seller and a willing buyer agree amongst themselves on the valuation of the item. This value will be determined based on those two people’s collective knowledge and needs—and very little else! Lastly, there is the notion of “Real World Market Value” of concert posters and handbills. This is the value that most of the callers we receive are interested in determining. “Real World Market Value” is the actual amount of cash that a poster can be sold for RIGHT NOW. This is not a theoretical number, or past sale of another poster, but the actual amount that poster can be sold for TODAY. It is also, not surprisingly, the number most important to the majority of callers we hear from on a daily basis. Psychedelic Art Exchange is pleased to provide all collectors with a totally FREE, Real World Market Valuation of each and every vintage concert poster and handbill in their collection. Even more exciting, we guarantee that you will receive your Valuation in 24 hours! Contact us and request your free appraisal. We will ARRANGE AND PAY ALL SHIPPING COSTS to have your posters sent to our Gallery in Baltimore, Md. Of course, if you are in the mid-atlantic region, you may also arrange to visit us in person. We will inspect the condition of your material and guarantee to provide you with a Real Market Valuation of your vintage concert posters and handbills within 24 hours of receipt. Please understand, this will not be a theoretical valuation or guess. It will be the actual amount you can turn your posters into cash, IMMEDIATELY. If you are looking to sell, this is the only number that really matters. The valuation you receive will be based on our 75 years of collectibles experience combined with the extensive “Want Lists” of our worldwide clientele and the current market price on the very day we receive your posters. If you wish to sell your collection based on your valuation, you will receive funds that will be Fedexed or wired to you the very same day....again, GUARANTEED! If you don't wish to sell, we guarantee to return your items to you the SAME DAY, by Fedex AT OUR COST. To the best of our knowledge, this is the most generous offer available in collectible's market today. We will provide you with a detailed, full appraisal of your vintage concert posters and handbills, ABSOLUTLEY FREE. We will also pay your shipping costs, BOTH WAYS. And we guarantee to do all this in 24 hours! Because the tiny supply of surviving Vintage Concert Posters does not come close to meeting the current demands of our clientele. We are in constant need of quality material, and finding sellers of these posters is FAR more challenging for us than finding buyers.So it makes good business sense for us and it makes good business sense for you, if you want to find out what your collection is really worth. So don't delay, contacts us TODAY to receive a FREE real market valuation of your vintage concert posters and handbills. You have everything to gain and absolutely nothing to lose! Selling your vintage concert posters through public auction is often a great way to turn your posters into cash! Use our auctions to turn your vintage concert posters into cash! Let's examine both the positive and negative aspects of selling through auction, and then we’ll show you how to get your vintage concert posters in front of scores of hungry bidders. 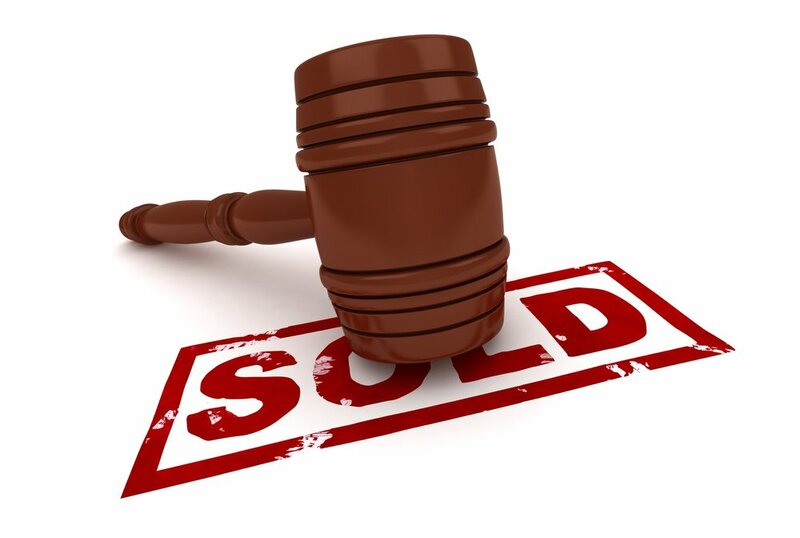 1) Auction sales take substantial time to plan, conduct, and collect the funds from winning bidders. Typically, you will consign your material to a sale 45 days before the auction is conducted. Our auctions usually run for 7 days. You receive your proceeds 21 days after the auction closes. This means, that on average, you should expect to receive your funds 7-8 weeks after you have consigned your material to auction. Clearly, this is a huge negative compared to receiving immediate payment through a private sale. 2) Auction sales, by definition, require you to relinquish control over how much you receive for your posters. As the old saying says, you have to be willing to take risks to get rewards. We have hundreds of success stories where collectors receive more than they expected for their material at auction. But there has also been are collectors that didn’t receive the results they expected. There are many reasons this is reality, a reality that is often shielded from view by auction companies hungry for consignments. In any given auction, your material may not be as good as other lots that are competing for collector’s attention, the stock market could have taken a dump, or some other news event could temper bidder’s enthusiasm. If you have a firm number in mind of what you MUST get for your poster(s), then auction is probably not right for you. 3) Auctions involve fees that can bring the total amount realized below expectations. Let’s say that you believe market value of your poster is $1,000. The poster comes up for auction and the final bid price is $1000.00. After you deduct a 10% seller’s fee, you receive $900.00, failing to meet you expectations after waiting several weeks. Collectors enter an auction excited with the possibility that they may be able to snap up a bargain. Once bidding commences, these same bargain hunters often catch “auction fever” and bid more than current market prices in an attempt to win the object of their desire. This is referred to as a "bidding war". If you are selling your poster with a reserve price, you are telling collectors there will be no bargain here, so your poster will most likely won’t even be considered to be bid upon. This is the exact opposite situation of what you are hoping the auction creates. 4) Despite these negatives, auctions can be a highly rewarding way to sell your vintage concert posters for top dollar! If you don’t know exactly what your posters are worth, there is no better way to find out than letting “the market decide”. If you have special material that is rarely seen, then auctions can provide a competitive environment filled with hungry bidders These bidders will pay top dollar for the right to be the next owner of your rarities. In every auction there are lots that bring far more than anticipated and if you are the lucky consigner these lots could be yours! The bottom line is that consigning your vintage concert posters to auction is a highly viable and very popular way to sell, as long as you enter the arena with your eyes wide open to both the risks and rewards. Psychedelic Art Exchange has a large, international clientele that enjoys and enthusiastically participates in the auctions we conduct each month. We stand ready to individually analyze each and every poster in your collection, and can provide a detailed plan to maximize the amount of money you receive for your collection in the most expeditious way possible. No matter what you decide, public auction or private sale, you can be confident that your vintage concert poster collection will be handled in the most professional way possible, using all of the expertise we have attained through a combined 75 years of professional dealing in the collectibles industry. If you have vintage concert posters you want to sell, please contact us NOW, to get the absolute highest prices possible!